Relax and enjoy holiday living on absolute waterfront, in the ideally located two and three bedroom apartments of Sails Resort on Golden Beach, with superb views and only minutes walk to local facilities. These panoramic water views are truly superb, bringing together the ever changing colours of the ocean, the tidal waters and sandy islands of Pumicestone Passage, the natural beauty of the northern tip of Bribie Island and the Caloundra CBD skyline. Most apartments are air conditioned. There are elevators to all floors and each apartment has a lock-up garage. The heated pool and spa are set in wheel chair accessible gardens with a gas BBQ and outdoor dining area. 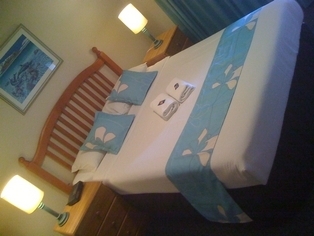 Stay in comfort and relax or fish, windsurf, canoe or sail at Sails Resort. 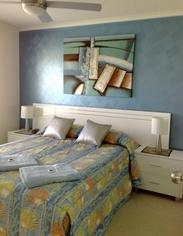 Completely self-contained spacious apartments are managed and maintained by on site managers. There is no road to cross to access the waterfront, and the layout of all units ensure that magnificent water views are seen from the living areas. 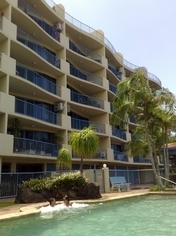 Sails Resort on Golden Beach is ideally located in Caloundra, only 100 metres from a shopping centre, and a short stroll to Caloundra CBD. Australia Zoo, Aussie World, Wineries, galleries, restaurants and clubs are all close by. Fully self-contained apartment which sleeps four (4) people, with a queensize bed in the master bedroom and two single beds in the second bedroom. 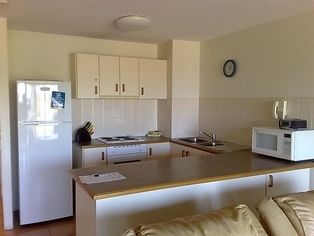 The kitchen is equipped with microwave, dishwasher, cutlery, crockery etc. The laundry has washer, dryer, tub, clothes basket and airer. Lock-up car accommodation and lift to your door. Fully self-contained apartments which sleep four people, with a queensize bed in the master bedroom and two single beds in the second bedroom. The kitchen is equipped with microwave, dishwasher, cutlery, crockery etc. The laundry has washer, dryer, tub, clothes basket and airer. Lock-up car accommodation and lift to your door. Fully modernised self-contained apartment which sleeps four, with a queensize bed and two king single beds that can be zipped together to form a queensize bed in the second bedroom. The kitchen is fully equipped with microwave, dishwasher etc. The apartment also has a rooftop area(subject to availability)featuring a Teppanyaki BBQ, an outdoor dining setting for 6 people and 4 deck chairs. The laundry has washer and dryer. Lock-up car accommodation and lift to your door. The apartments are warm in winter yet cool in summer. The apartments are fully self-contained with all modern conveniences and utensils. They provide spacious and extremely comfortable living for six (6) people. The light-filled living area provides spectacular views, as does the balcony overlooking the water.Alternatively, enjoy the liveliness provided by uninterrupted views of Caloundra. It is security screened. Lock-up car accommodation is provided. The apartment is fully self-contained. It provides spacious and comfortable living for six people. 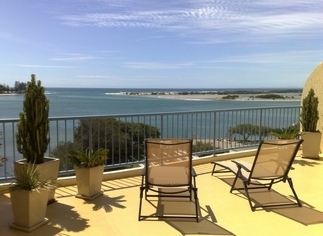 The light-filled living area provides spectacular views of Bribie Island and Pumicestone Passage. 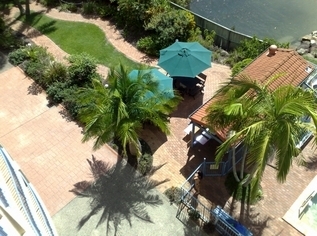 The apartment also has a rooftop BBQ & entertainment area your exclusive use. Lock-up car accommodation is provided. One lockup garage is provide per apartment. Visitors carpark within the property. 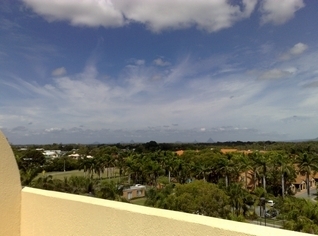 From the Bruce Highway (M1) about an hours drive north from Brisbane, follow Caloundra Road (6) for about 9 kilometers. Go past McDonalds and KFC. The Stockland shopping centre is to the left and Cold Rock Ice Cream on the right. Turn right at the traffic lights into Park Place which then becomes Landsborough Pde. We are the first building on the left hand side on the bend opposite North Street and Rydges. Take care, the entry is easy to drive straight past. When entering Caloundra, proceed past the first sign to Golden Beach and turn right at the traffic lights (past Kentucky Fried Chicken and opposite Sunland Shopping Centre). 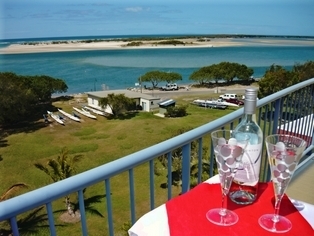 Sails Resort is the first complex on the left-hand side - 3 Landsborough Pde, Golden Beach. There is another airport at Maroochydore if you prefer to fly to the Sunshine Coast. This is for domestic flights only. From here it is about a 30 minute drive south to Sails. Caloundra also has a small airport but this is for light aircraft only. 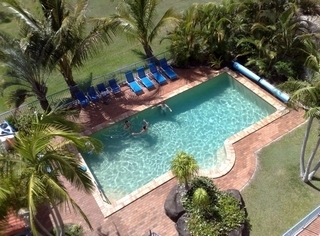 We have a heated swimming pool with a spa and a barbecue area. There is a waterfront park at our back fence where you can fish or paddle or kayak. A sandy calm water beach is about 300 m south and a childrens playground on the waterfront. You can hire tinnies, sailboats and surf skis close by. Bulcock Beach is a 10 minute walk, Kings Beach 25 minutes. Australia Zoo is 20 mins drive, Big Kart Track 15 mins. Aussie world is 10 minutes. Underwater World 30 minutes. A path to Diamond Head is a nice level bike/scooter ride for an hour or two. Or sit on the balcony and just watch the ships go by.